Although track and field is mainly running, it is important to keep the entire body conditioned during the off seasons. Strength and conditioning is important in track and field because the athlete that is in the best shape and most prepared should win. It is impossible to have a weak upper body and throw the shot put far, it is also impossible to be generally weak and undynamic and run the hurdles the fastest. When an athlete is lacking strength and conditioning, an athlete usually suffers technique. This is champions are made in the off-season. Three important parts to keep in mind while training during the off season is strength training, training on the track, and thinking about your diet. 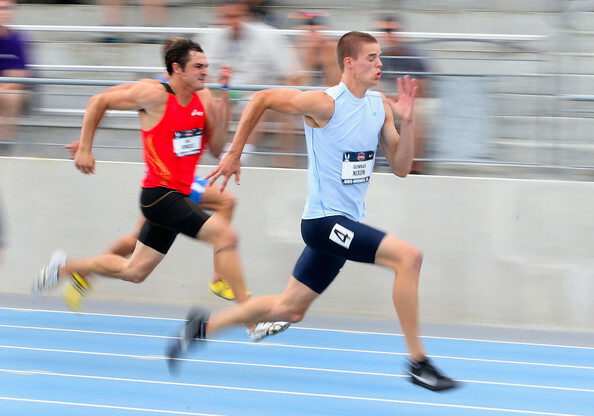 Muscular endurance is important for track for your body to get through intense training drills and practice in general. Since practices can be long and draining, it is hard to get in the weight room during season, so off-season is the perfect time to get in the weight room and put in extra work. Weight training can also improve your body for season to prevent aggravating injury during season. Weight training will make muscles stronger and less likely to be pulled. Squats and calf raises are advised for the lower body and bench press and upright rows are suggested to strengthen the upper body. It is important to stay on the track even during off seasons. The ideal off-season track workout is starting with a low intensity run as a warm up. After the warm-up move to interval drills. Interval drill would be jogging at a light speed for 30 seconds, build up the job to a 20 second moderate pace, finish up the minute with a 10 second full speed burst. It is advised to repeat this interval drill for three to five minutes with a 45 second rest period in between each set. One last key to maintaining your fitness for season is watching your diet. Plenty of protein, fish, fruits and vegetables along with staying hydrated will help you during and after your intense training sessions. If you need any help coming up with an off-season training program, Island Sports Physical Therapy has fitness programming and would love to help you prepare for your upcoming season. For a fitness plan, or for any physical rehab, call 631-462-9595, or log onto our website www.islandsportspt.com and make an appointment for any of their 6 convenient locations across Long Island.